It seems like the Galaxy S9 and Galaxy S9 Plus won’t be the only devices that Samsung launches at MWC this year. An unannounced Samsung tablet has been spotted on benchmarking website, GFXBench and reports suggest that it could be the Galaxy Tab S4. According to the listing, the alleged Galaxy Tab S4 tablet bears the model number SM-T835 and is equipped with a 10.5-inch display with a resolution of 2160 x 1600 pixels. The device is powered by a Qualcomm Snapdragon 835 chipset with Adreno 540 graphics. In terms of memory, it may offer 4GB RAM along with 64GB of inbuilt storage. At the back, the device is tipped to feature 12MP camera, while at the front it may have an 8MP camera. The device is also listed as running Android Oreo. 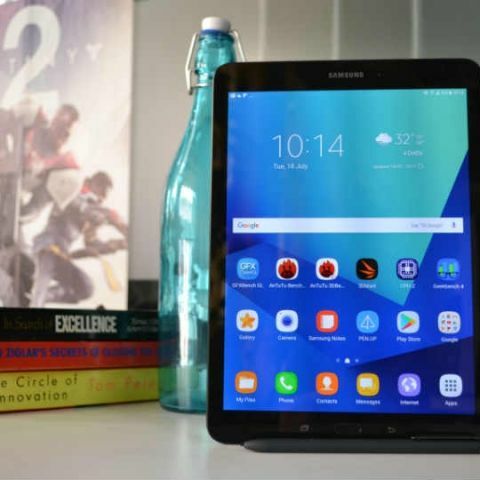 To recall, The Samsung Galaxy Tab S3 was launched in India in June last year at Rs 47,990. The device was a competitor to Apple’s 10.5-inch iPad Pro and offered a 9.7-inch Super AMOLED display with a resolution of 2048 x 1536 pixels. The display is HDR compatiple and Samsung claims that the Tab S3 covers 99% of the Adobe RGB and 97% of the DCI-P3 colour gamuts. The tablet also comes bundled with the S-Pen. As for the hardware, the Samsung Galaxy Tab S3 is powered by a Snapdragon 820 SoC with 4GB RAM. It offers 32GB on onboard storage, which can be expanded by up to 256GB via a microSD card slot. At the back is a 13MP camera, while at the front is a 5MP unit. The tablet is equipped with a 6000mAh battery and supports 4G LTE. You can check out our review of the Samsung Galaxy Tab S3 here.